At the beginning of the Second World War, every major nation had a tanks of some description. What very few nations had was an effective way for infantry to counter them. At the time, the only way to disable a tank was with a risky sprint and throwing of a satchel charge (unofficially) or use of an anti-tank rifle. However anti-tank rifle technology was a hangover from the Great War and was already pretty outdated by the quality of armour on most tanks and was only useful against light armour and soft-skinned targets. After the Battle of France, the British Army studied reports of infantry/tank contacts and failed to find a single example of the Boys anti-tank rifle actually destroying a tank. The Projector, Infantry, Anti-Tank or PIAT was what Britain came up with. Designed by Major Jefferis of MD1, the toy box of the War Office, with a great deal of input from Major Blacker of Blacker bombard fame. The basic design was that of a Spigot mortar, adapted for use as a direct-fire system. 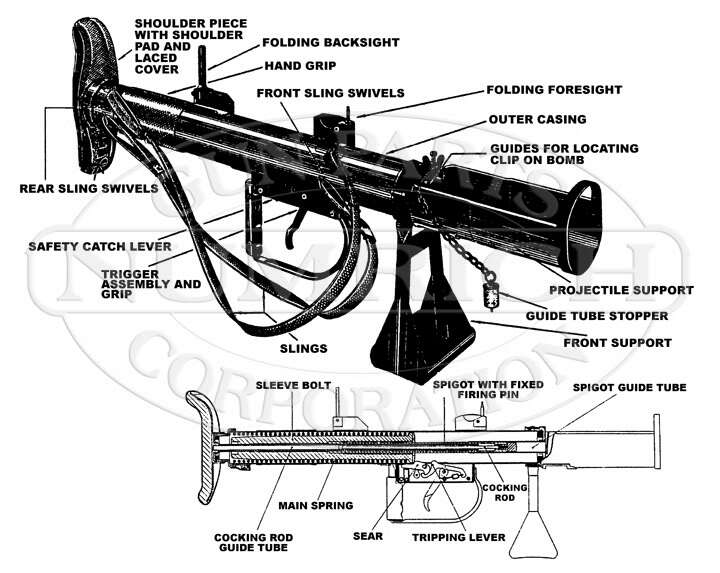 In this diagram you can just make out the guide tube in the centre of the projectile support. The missile slots over this and the firing pin travels through it. The effectiveness of the PIAT in use is much debated. Some sources cite that ammunition was unreliable, others that accuracy was a major issue at any kind of range and many that recoil was truly horrendous (some users said that you deserved the Victoria Cross just for firing it!). However a study of Canadian Officers ranked the PIAT as the number one most “outstandingly effective” weapon, above even the Bren, so in spite of its many foibles it was clearly well enough liked! The PIAT was used by British and Empire forces throughout the war both as a direct fire anti-tank weapon and indirect fire support weapon. It was also given to the Soviet Union as part of lend-lease, dropped to partisans throughout Europe as well as by Israel post-war. It was last used officially by the Australians at the start of the Korean War, but it was quickly replaced. As progress occurs we shall of course keep you posted on this build (follow the blog to help you keep track! ), if this has inspired you to want a project of your own or you have any questions, do drop us a line! Our email is: enquiries.vintageairsoft@gmail.com. Also, ‘Like’ our Facebook page for updates and interesting articles.